Thank you so much. All the hosts and guides were very friendly and knowledgeable. Really great stay! Many thanks for a wonderful stay! Super activities and a great schedule! We feel very grateful for letting us stay here. A very special experience and such a warm welcome from Barb & Dannie at the WFC. They generously shared time and their knowledge of Hiroshima with us. It is a true privilege to stay here. Thank you for so openly welcoming our baby daughter! Staying here definitely adds to the experience of visiting Hiroshima. Dannie and Barb were a wealth of knowledge and eager to share and give you as much (or as little) additional information as you want. What an honor to have the opportunity to hear a hibakusha tell his story! Only regret is that I couldn’t spend more time. So glad to support the mission of this place by staying! Thank you again! This was the most amazing experience of my life!!! The WFC is the perfect location! Easy walking distance to the Peace Memorial, plenty of local restaurants, the room was very comfortable and clean! Dannie and Barbara and all of the other volunteers are doing amazing work spreading the knowledge of what happened in Hiroshima. An absolute unforgettable stay! Meeting Okada san and hearing her survival story was priceless. The guided tour through the Memorial was extremely informative. We did manage to unintentionally stump the tour guide, Miho, with a question and the team made sure to come back to us asap with an answer after our tour. Dannie and Barb ensured we had everything we needed and went out of their way to help us. If you’re looking for a great cozy place to stay near to the Memorial with the most hospitable and wonderful people, you MUST stay here! Cannot express sufficiently how much this meant for us. We’ll try to spread the message and hope that many will follow. Thanks for the intense experience. Thank you for sharing such a personal and moving account of your terrible experiences resulting from the A-bomb blast. Our prayers are for peace to come to all people as God provides the strength and understanding to us all. Thank you again! I really enjoyed Etsuko’s talk tour at the peace park. 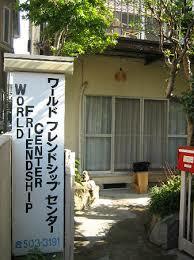 Her talk was a particular highlight, as was the history behind the World Friendship Center. We felt so welcomed and comfortable at the WFC. An interesting and thought provoking stay, a unique chance to learn more about Japan’s past and hear personal stories. Thank you for this wonderful experience. Lovely stay! Wonderful, informative hosts who generously shared time and stories with us. Great location. WFC provided me with experiences I could not have imagined. The hosts were overly kind and made me feel at home. Thank you so much! We had a wonderful time at the WFC. Barbara & Dannie were amazing hosts. They are extremely kind and welcoming. We will definitely recommend the WFC to others. We hope to come back some day. Thanks! Thank you for our lovely stay here in WFC! We were very moved and touched by the hibakusha story as well as the wonderful Peace Park tour. Thank you for making such experiences possible! Thanks for an informative visit and comfortable accommodation! Really glad to get to know this place and the people working here. Thanks a lot. Thanks for the accommodation. Perfect. We had an amazing stay at the WFC. We stayed for 3 nights and had a talk by a hibakusha (survivor) which was very interesting followed by the Peace Park tour. The people we met were all enthusiastic about their subject which made it very enjoyable and interesting. The lodging was also comfortable and for our next Japan travel we plan on coming back. Thank you so much for the amazing stay! It gave me so many new perspectives on life that I won’t forget. I will spread the message of the WFC as far and wide as I can. Hopefully we will see each other again soon! Very hospitable and warm culture in which to enjoy Hiroshima. We loved the company and the opportunity to learn about the historical events of the nuclear bomb. What a great way to learn the lessons of Hiroshima – by connecting with bomb survivors and people committed to nuclear disarmament. Plus, the hospitality was great and the accommodations comfortable. I would love to come back! Thank you, Barb & Dannie! Very nice and calm place, with interesting history. Great hospitality. Warm and friendly hosts. Thank you for your hospitality and great breakfasts. Learnt a lot about history during my stay here. Dear Barbara, dear Dannie, Thank you very much for the warm welcome here in Hiroshima. We enjoyed our time very much. In these times, places like WFC are getting more and more important. Thank you for your engagement. Wonderful and inspiring people who run this center. Also good accommodation and very excellent price/quality. It was a pleasure staying here and we continue our trip (re)loaded with energy and inspiration! Thank you very much!